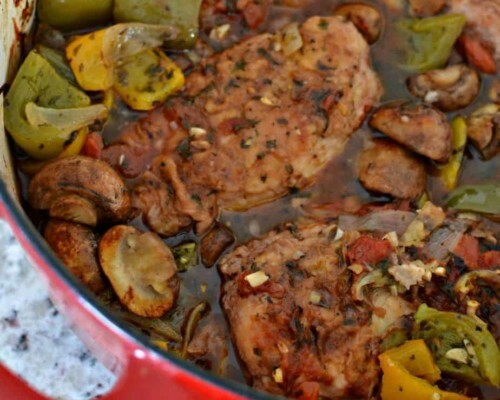 Chicken Cacciatore Recipe is one of our favorites. There are a couple of ways you can cook this recipe and I guess it depends on what is best for you and your family taste wise and time wise. You can also change up the ingredients for those of you who don’t like mushrooms. In Italian the word “cacciatore” means hunter. Chicken or rabbit is prepared “hunter” style using onions, herbs, tomatoes, bell peppers and sometimes red wine. This dish can be prepared on the stove top or be prepared using both the stove top and the oven for super tender chicken. The stove top version is a little faster and leaves your peppers not as soft. The chicken is unbelievably tender with the stove top/oven version but it does take longer. More vegetables can easily be added to complete the meal or stretch it a little further. How to make Chicken Cacciatore Recipe! First dunk the chicken in a little beaten egg. Then dredge it in some flour seasoned with salt and pepper. Heat a little oil either in a large skillet if cooking on the stove top or in a dutch oven if finishing in the oven. Brown the chicken and place on a plate. Heat a little more oil in the pan and add onions and bell peppers. Cook for just a few minutes and add the garlic, parsley, basil and onion powder. Then add the chicken back to the pan. Add the wine, fire roasted tomatoes and tomato sauce. If cooking on the stove cover with lid and gently simmer for twenty-five to thirty minutes. If cooking in the stove cover dutch oven with lid and place in stove for a little over one hour. Meanwhile in medium skillet over medium high heat add butter and saute mushrooms until browned. 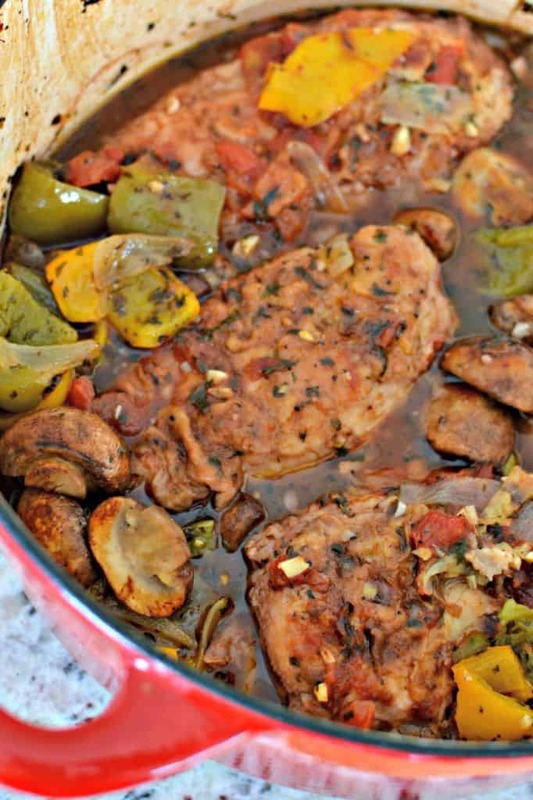 Add browned mushrooms to either the skillet or the dutch oven ten to fifteen minutes before the dish is done. 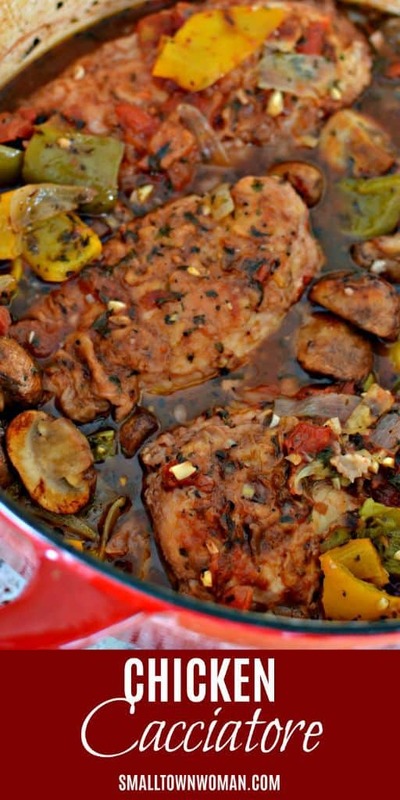 What do you serve with Chicken Cacciatore Recipe? The possibilities are endless. Angel hair pasta, rice, smashed cauliflower and roasted potatoes are all excellent sides. There are a lot of vegetables already in this dish but a side of broccoli or roasted carrots are always welcome at the dinner table. If you are cooking this dish in the oven simply add your peeled potatoes and carrots right before adding the dish to the oven. 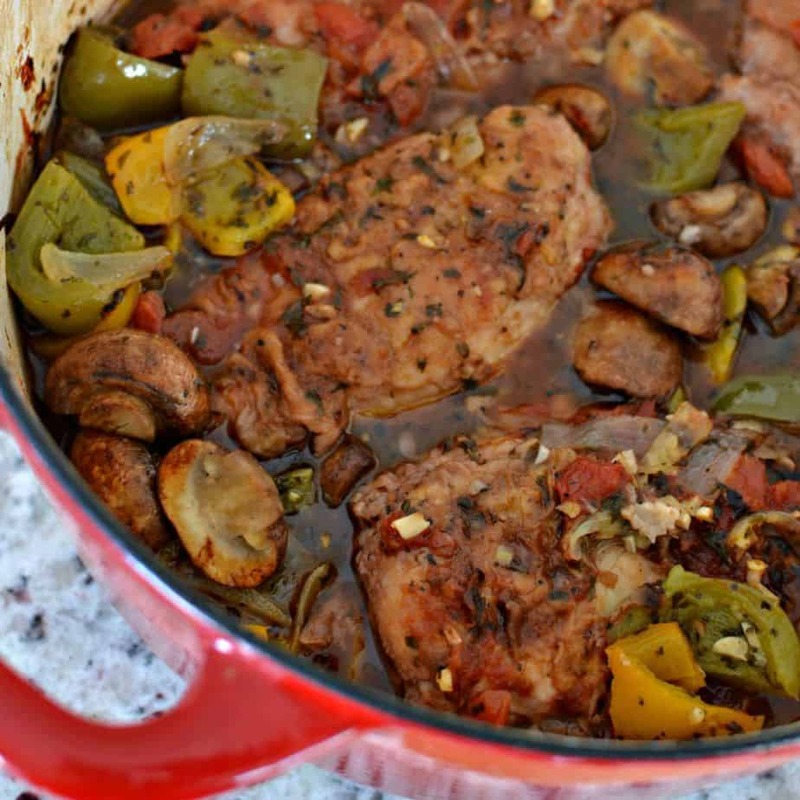 Helpful hints to make this Chicken Cacciatore Recipe awesome. Bread your chicken lightly and brown well. Wipe out the pan with a paper towel to remove any flour that may have blackened. Use fresh not frozen onions, bell peppers and garlic. Brown your mushrooms before adding to this dish because it really does make a difference. If placing this recipe in the oven do not cook peppers and onion for more than a few minutes before adding the garlic and other seasonings as they will have plenty of time to cook in the stove. Use a quality dry red wine. Therefore some suggestions are Merlot, Cabernet Sauvignon, and Pinot Noir. If your prefer substitute chicken broth for the red wine. This dish is really a meal in itself but if desired you can serve over angel hair pasta, rice, roasted potatoes or smashed cauliflower. If you are cooking this dish in the oven and would like additional vegetables add peeled potatoes and carrots right before adding the dish to the oven. 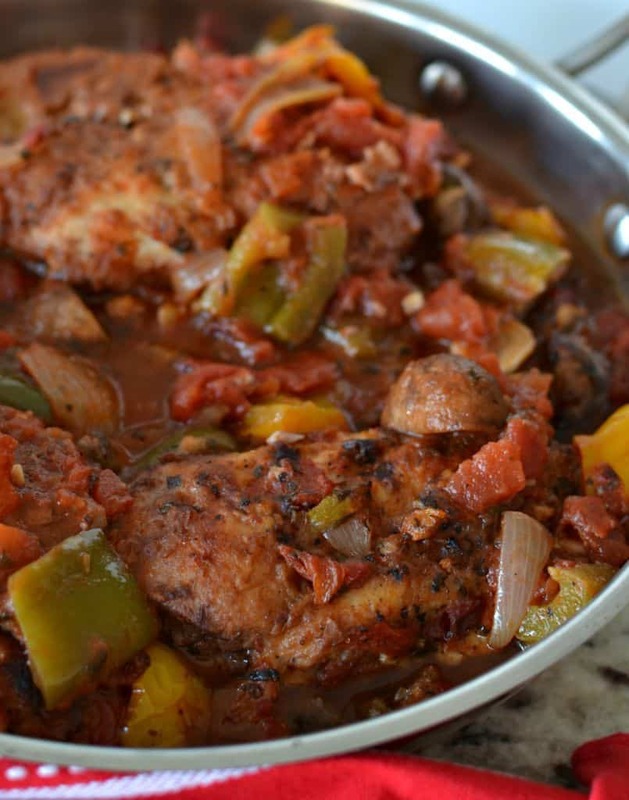 This Chicken Cacciatore Recipe is lightly breaded chicken breasts with tomatoes, bell peppers, onions, mushrooms and garlic in a blend of Italian spices. The safe internal temperature for cooked chicken is 165 degrees.